They called her name and she headed to the stage. As excitement kicked in, Christine Gonzales’ main concern was not to fall in front of all the photographers taking pictures as she was going up the steps. Gonzales, a Mason student, was given what she calls an amazing opportunity to sing the national anthem at one of President Obama’s campaign events in Woodbridge, VA on Sept. 21. Singing has been part of Gonzales’ life since she was three years old. Back in San Diego, where she was born and raised, she and her sister, Melody, were in musicals and community based theaters. For six years, she did mariachi. She also plays the violin. Graduating next May, Gonzales entered Mason as a voice major for two years, but transferred to New Century College to concentrate in community and public engagement. “I decided that I don’t need a degree to sing or to enjoy music, but I needed the knowledge and experience working with leadership, non-profit organizations and the business sector.” Gonzales said. Community leadership is a part of her upbringing and her family. 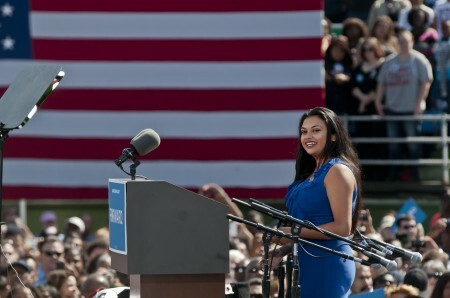 Her sister, Melody, is the Latino Vote director for the state of Virginia in the Obama campaign and suggested that Christine submit her name and a short bio to the campaign offices for the possibility to sing at the president’s event. “I got the email confirmation the night before the event,” Gonzales said. Gonzales also helps with registering citizens to vote, one of the activities organized by the grassroots movement that seeks to get the president re-elected. She prefers to sing for a multitude of strangers, as long as there is no one she knows in the audience. “I had a lot of people angry at me because I didn’t tell them,” Gonzales said. Those who saw the picture she posted responded with encouraging and supportive remarks. Christine did not get the chance to shake the president’s hand. They came on and off the stage through different entrances and their paths never crossed. “I’ve seen him speak. He is an amazing speaker; I would love a hug. But it’s not my time yet,” she said. At the end of the event, she walked toward her car and amazingly people recognized her and stopped her saying what a great job she had done.